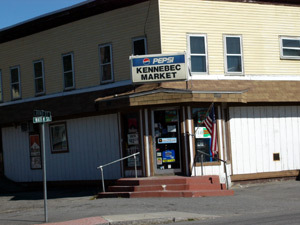 I stopped into the Kennebec Market today to see what kind of coffee they had. Not very good, which is strange for up here. 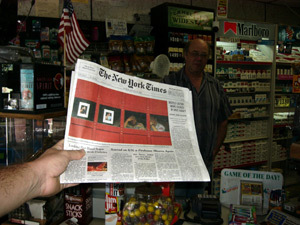 I started talking to Pete the proprietor about the different papers he sold. He had a Bangor paper right at the top. He said the views were more conservative than the Kennebec Journal. I told him I could see that, the people being further away from civilization- you would think they would be less informed. (I guess I am stereotyping.) Then, since I didn't get any coffee, I said "Nice to meet you, I guess I'll be back when you have something I want to buy." On the way out I noticed the Boston Globe, then The New York Times. "Ahh, The New York Times, I guess you do have something I want. Wow, I got the last one. Geez, how many of these do you sell," I asked. "That's the first one I've ever sold," said Pete. "What! Kind of tells you something about the people around here," I said.